Are you tired of facing the rusty and filthy garage door every single day? Are you bothered by looking at the thousands of boring garage doors of the same colors and styles in Georgia? There are actually plenty of smart and inexpensive ways to change the image of your house starting by transforming the dull door into a stylish object, which will not only add to the appearance of your house, but it will also make your property unique. 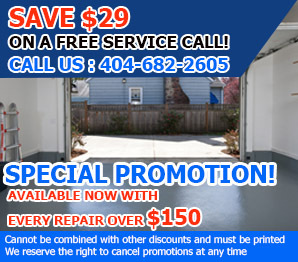 The proper garage door maintenance service includes cleaning as well and not only the fixing of the opener problems. Do you remember how shiny your door was when the garage door company installed it? Its beautiful image usually disappears after a few years due to the dust, the elements and possible other problems like corrosion. The procedure of cleaning the door is not boring or time consuming and requires only water, a soft detergent and a soft sponge, but you must also remember to remove the dirt from the garage door tracks. If you like to draw, this is your chance to prove your talent. You don't have to be Michael Angelo or paint Mona Lisa; you can choose any image you want, but you must make sure you are using the right paints and keep them away from the garage door parts to avoid problems with their performance. If you consider paintings and graffiti too intense for your tastes, you should choose a beautiful color of your preference, but you should make sure that the old painting will be completely removed from the door and the surface will be clean from dirt, mold or rust. If you can afford it, garage door replacement would certainly be the best solution for your house. You can choose any material painted in any color or a modern glass doors that will transform your garage into the best room of the house.